It appears that Lamborghini has something special in store for the world at this week's Paris Motor Show, and all indications are that it's a 900-ish horsepower hybrid hypercar possibly called the Lamborghini Asterion. And this is the best look we have at it so far. Is This The Lamborghini Asterion Hybrid? 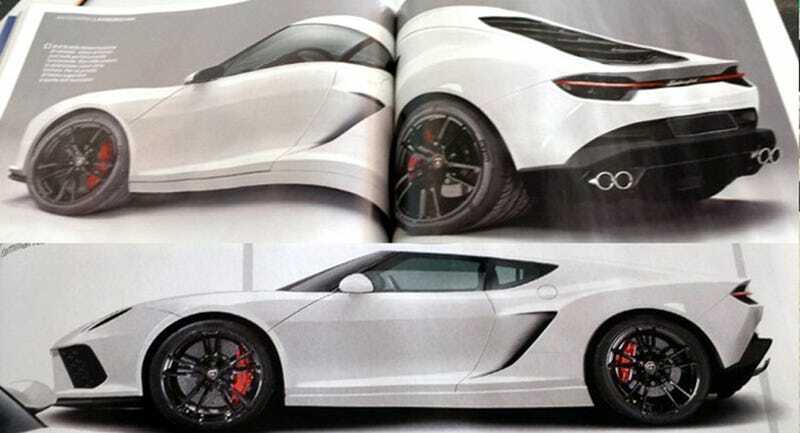 Carscoops reports these magazine scans come from the Italian magazine Quattroroute, which also claims the car will have a gasoline V10 engine and three electric motors for a grand total of about 900 horses. Other than that, and the possible name Asterion, we don't know much about it. It's interesting for sure, and Lamborghini's first entry (and the Volkswagen Group's second) into the hybrid hypercar realm is definitely compelling. But I'm a concerned the design is a little too tame for Lamborghini. Couldn't we have had the Veneno instead? Expect more details on this mysterious car later this week, or sooner if it leaks.